Namibia - Invest-Namibia | Investieren und unternehmen in Namibia. A country that gives entrepreneurs the unlimited freedom and space they need to create, to grow, and to shape the future. A country of endless creativity and drive, with a pioneering, enterprising spirit. In Namibia, investors will find ideal conditions for making their business idea a reality. Learn more about your opportunities, and hit the ground running with your business. The government and institutions of Namibia will be at your side every step of the way. Since gaining its independence in 1990, Namibia has been on a path to success, boasting both political and economic stability. Prosperity and quality of life are steadily rising. In the World Economic Forum’s Global Competitiveness Report 2014/15, our country ranked fifth in the region. Additionally, Namibia has achieved consistently high economic growth in recent years, and it shows no signs of stopping. Inflation, foreign debt, dependence on international aid, and the budget deficit are all commendably low. Namibia has implemented market-oriented economic and financial policies and liberal laws, which have created an overall investment climate that benefits businesses from around the world. Thanks to its advantageous geographical location, Namibia is ideally connected to the rest of the world and is well on its way to becoming the entire SADC region’s hub for trade with Europe, Asia and the USA. 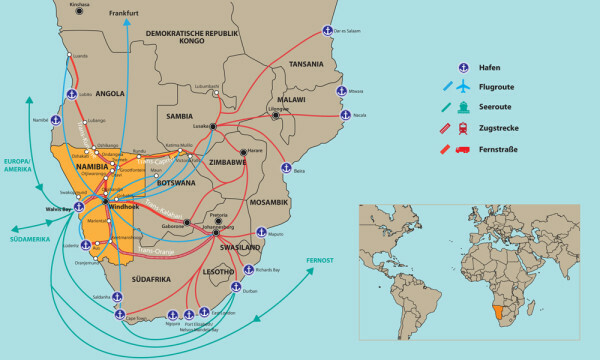 The country also serves as a jumping-off point for access to southern Africa: 15 countries make up the free-trade area of the Southern Africa Development Community (SADC), with its domestic market of nearly 300 million residents.